Traditional vascular probes, also known as linear probes, are high frequency ultrasound probes that provide excellent imaging of superficial vessels and structures. The probes produce good resolution and less penetration than other probes, making them ideal for ultrasound-guided procedures. Typically, vascular probes are used in evaluation of deep venous thrombosis; to assess skin and soft tissue for abscesses or foreign bodies; for examining musculoskeletal structures; testicular and ocular ultrasounds; evaluation of the pleural line for pneumothorax or interstitial fluid; and to diagnose appendicitis in thin patients. More recently, intravascular ultrasound probes have been developed and are being used in a wide variety of biomedical applications. The probes, which are attached to computerized ultrasound equipment, perform high frequency ultrasonic scanning from within the vessels to obtain high resolution images. Using compound scanning with high spatial resolution, the miniaturized probes visualize the inner walls of blood vessels and provide superior assessment of arterial plaque morphology. These probes are particularly valuable for situations in which angiographic imaging is unreliable, such as in regions with multiple arterial segments that overlap. Intravascular probes are most often used to image the coronary arteries to assess the amount of plaque build-up and the likelihood that plaques will rupture and generate emboli. They are also used to facilitate vessel stenting, retraction and occlusion, as well as reconnection of blood vessels, especially in coronary arteries, and to assess the effects of stenosis treatments. The Synovis Surgical Innovations Vascular Probe measures the internal diameter of vessels and serves as an intravascular retractor for procedures including coronary bypass, femoral-popliteal bypass, tibial bypass, peroneal bypass and dorsal-pedal bypass, in addition to imaging blood vessels. A new line of transit time flow measurement probes introduced by Medistim provide fast, accurate measurement of blood volume flow during peripheral vascular surgery. 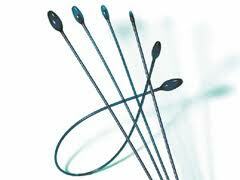 The probes are designed for use in larger vessels with diameters of 5 to 18mm. Recent intravascular probe developments include integrated optical coherence tomography (ICT) and ultrasound systems for intravascular imaging, and a system which combines intravascular photoacoustic and ultrasound imaging of atherosclerotic calcification.